To Cite: Mardani M, Aslani N, Geramishoar M, Khodavaisy S, Mohseni S, et al. Disseminated Nocardiosis in an Immunocompetent Individual Infected with Nocardia brasiliensis, an Opportunistic Agent, Arch Clin Infect Dis. 2017 ; 12(1):e37738. doi: 10.5812/archcid.37738. Introduction: Nocardia species are described as opportunistic pathogens that mainly cause pulmonary nocardiosis in immunocompromised individuals, particularly in patients with acquired immune deficiency syndrome (AIDS), intravenous drug abusers, strongly burned victims, the Cushing syndrome, the ones underlying transplantation, and prolonged use of corticosteroids. Case Presentation: The current paper reported a case of disseminated nocardiosis in a 28-year-old Iranian male who had type 2 diabetes mellitus with prolonged use of corticosteroid for the last 5 years. He was admitted to the department of infectious diseases at Shahid Beheshti hospital, Tehran, Iran, following a complaint of pneumonia (chest pain) and presented a subcutaneous purple nodule on the left thigh without pain. 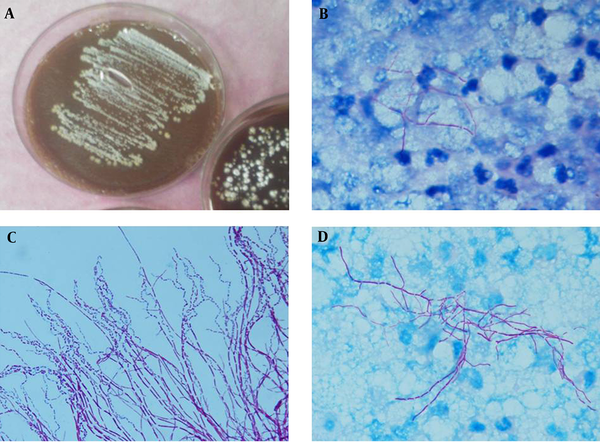 Direct microscopic examination revealed numerous filamentous branching and rod-shaped bacilli. The tentative diagnosis of chronic inflammation with nocardiosis was made. In addition, tiny, chalky white and irregular colonies emitting an earthy odor appeared on blood and chocolate agar and were identified as Nocardia brasiliensis by sequencing of 16S rRNA gene as a valuable method to identify clinical isolates. Combination therapy was performed by entire surgical excisions and intravenous TMP-SMX (160/800 mg/bid; IV) and meropenem 1g/tid. The patient’s condition improved after 8 days and he was discharged. Conclusions: Combination therapy with surgical excision has a synergistic effect and appears to be the best treatment for extended lesions. However, new potent antibacterial drugs may help to improve the management of such infections when there are sufficient data on their in vitro activity. The genus Nocardia is gram-positive, partially acid-fast and aerobic filamentous bacteria belonging to family Nocardiaceae in the order of Actinomycetales with a worldwide distribution that can be found in soil and other organic matters as opportunistic human pathogens (1). Due to the latest classification, Nocardia consists of several species viz., N. abscessus, N. brevicatena/paucivorans complex, and N. nova complex (which includes N. nova, N. veterana, N. africana, and N. kruczakiae), N. transvalensis complex, N. farcinica, N. asteroides N. cyriacigeorgica, and N. brasiliensis (2). Although, the latter agent and N. asteroides are the most common agents of disseminated nocardiosis, numerous Nocardia species, i e, N. otitidiscaviarum, N. farcinica, and N. concave are also occasionally isolated from human infections such as cutaneous and lymphocutaneous infection (3). Approximately half of the described species are associated with human and animal disorders. The incidence of nocardiosis caused by Nocardia species dramatically increases, it usually occurres through the inhalation or traumatic implantations in otherwise healthy individuals, especially in patients infected with human immunodeficiency virus (HIV), immunocompromised hosts, intravenous drug abusers, strongly burned victims, the Cushing syndrome, diabetes mellitus, and prolonged use of corticosteroids (1, 3, 4). The most common clinical manifestation of nocardiosis is pulmonary involvement that leads to disseminated infections resulted from hematogenous or lymphatic spread in immunocompromised individuals (1, 5). Diagnosis of nocardiosis can be easily missed due to the nonspecific clinical symptoms, histological findings, and the high degree of phenotypic similarity between closely related species of the genus (6). Identification problems are imminent since conventional approaches are relatively time-consuming and considerable expertise is required (7). Therefore, molecular methods with sufficient specificity, reproducibility and sensitivity should be employed (8). The current paper reported a case of disseminated subcutaneous nocardiosis caused by N. brasiliensis identified after 16S rRNA sequencing. A 28-year-old male Iranian chemical victim who had diabetes mellitus with prolonged use of corticosteroid (prednisone 100 g/day) was admitted to the department of infectious diseases at Shahid Beheshti hospital, Tehran, Iran, following a complaint of constant chest pain for 1 month. The first computed tomography (CT) scan of the chest revealed a nodule with cavitation in the left upper lobe, consolidations with air bronchogram in the left hilum accompanied by adjacent thin walled cyst and a few patches of ground glass opacities in the lower lung (Figure 1A). In addition, fibrobronchoscopy in the thorax showed purulent secretion. Furthermore, the first CT scan of the brain demonstrated a few hypodense lesions in deep white matter, which the largest was in the right frontal. Subsequently, swelling was found over the patient`s left thigh. Physical examination demonstrated subcutaneous purple nodules on the left thigh without pain, there were no signs of inflammation, or discharge of granules at the site of infections (Figure 1B). Full laboratory blood analysis revealed a hemoglobin level of 16.8 g/dL, white blood cells, serum electrolytes, and liver function test results were within normal ranges. Blood and urine cultures were sterile and serological tests for HIV were negative. During hospitalization, the initial empirical treatment with intravenous vancomycin (1 g bid) and ceftazidim (1 g/8 hours) was administrated. In addition Doppler and duplex ultrasound evaluations of the lower extremity veins (using 10 MHz liner probe) showed normal compressibility, normal venous, and normal response to augmentation. There was no evidence of acute or chronic Deep Vein Thrombosis (DVT). Therefore, normal Doppler evaluation was concluded on the left and right lower extremity veins. However, sonography of soft tissue revealed 2 extensive masses (62 × 27 × 26 mm and 51 × 34 × 38 mm in size) growths which affected the surrounding bone with 14 mm and 12 mm under the skin, respectively. Both of them had low level internal echogenicity and could be abscess. Patient did not remember any history of travelling to rural areas, trauma or puncture at the site of the infections. Subsequently, abscesses were encapsulated, and the pus black fluid, which was predominately caseous, was aspirated and transferred to the microbiological laboratories for further analyses. Figure 1. A, chest X-ray revealed cavitatory lesions in the LUL lung along with a few patches of ground glass opacities in the lower lung; B, swelling over the left thigh (after treatment). The excised mass was sent for microbiological and histopathological examinations. Direct microscopic examination (KOH 10%) demonstrated large amounts of thin, branching hyphae, similar in appearance to actinomycetes. Following this examination, the biopsy specimens were also stained with Kinyoun acid-fast using weak acid (1% sulfuric acid), which revealed many filamentous branching and rod-shaped elements forming mycelia. Granulomas consisted of epithelioid cells with central and peripheral giant cells surrounded by neutrophils (Figure 2B-D). The tentative diagnosis of chronic inflammation with nocardiosis was made. The obtained specimens were cultured on blood agar, brain heart infusion agar with 5% sheep blood (Oxoid Ltd., Basingstoke, Hampshire, England) and chocolate agar (5% carbon dioxide atmosphere) and incubated at 37°C for up to 3 days for bacterial investigation; also, on Sabouraud dextrose agar (SDA; Difco) supplemented with chloramphenicol (0.5 mg/mL) and incubated at 27°C for 3 days. No fungi colonies were detected in the cultured specimens, but tiny, chalky white, and irregular colonies emitting an earthy odor appeared on blood and chocolate agar (Figure 2A). Partially acid-fast staining from colonies, as previously described (9), showed filamentous branching rods which initially identified as Nocardia species (Figure 2C). Voucher strain was deposited in the reference culture collection of invasive fungi research center (IFRC), Sari, Iran (IFRC 713). Basic identification was performed based on physiological criteria and results were as follows: Casein (+), gelatin liquefaction (+), hypoxanthine (+), and aromatic acid lipase (-) indicating the morphology of N. brasiliensis. Subsequently, molecular analyses were performed for identification to the species level. Briefly, DNA was extracted using an ultraclean microbial DNA isolation kit, according to the instructions of the manufacturer (Mo Bio, Carlsbad, CA) and stored at -20°C prior to use. Polymerase chain reaction (PCR) amplification of 16S rRNA using universal eubacterial primers 16S-Cont-F (5 GATTAGATACCCTGGTAGTCCAC-3) and 16S-Con t-R (5- CCCGGGAACGTATTCACCG-3) was performed as previously described (10). Briefly, amplification of 16S rRNA was performed as follows: Ten minutes at 95°C for primary denaturation, followed by 30 cycles at 95°C (30 seconds), 60°C (30 seconds), and 72°C (45 seconds), with a final 10-minute extension step at 72°C. PCR products were first run on 1.2% agarose gel and visualized with UV after SYBR® Safe staining and subsequently were purified using GFX PCR DNA (GE Healthcare, Buckinghamshire, UK). Sequencing was performed as follows: One minute at 95°C, followed by 35 cycles consisting of 10 seconds at 95°C, 5 seconds at 50°C, and 60°C (10). Sequence data obtained were adjusted using Lasergene SeqMan software (DNAStar, Madison, WI, USA) and compared with GenBank (http://www.ncbi.nlm.nih.gov/BLAST). The DNA sequence of the 16S rRNA gene matched that of N. brasiliensis (IFRC713 = GenBank KU219847) by showing 99% similarity with the ex-type strain of the species (ATCC 700358 = GenBank NR074743). The molecular results confirmed the bacteriological and histopathological diagnosis of the disease as disseminated nocardiosis caused by N. brasiliensis. A, Granular, wrinkled colonies of Nocardia brasiliensis on blood agar medium in 4 days; B-D, Gram-positive branching filaments isolated from cutaneous lesion (100X); C, Partially acid fast branching filaments in blood agar (100X). Additionally, antimicrobial susceptibility testing was performed, as previously described, using E-test method (bioMerieux, Marcy l’Etiole, France) according to the manufacturer’s instructions (11). Briefly, the inoculum suspension (1.0 McFarland) was spread on mueller-hinton (MH) agar with 5% sheep blood and antimicrobial agents, i e, imipenem, trimethoprim-sulfamethoxazole (TMP-SMX = SXT), tetracycline, clindamycin, ciprofloxacin, tobramycin, meropenem, ceftriaxone, amoxicillin-clavulanic acid and linezolid were used as E-test strip. The minimum inhibitory concentrations (MICs) were read after 72 hours of incubation at 35°C in dark. Interpretation was considered according to the clinical and laboratory standards institute document M24-A2 (9). Table 1 indicates the MIC results. For the case management, the lesions were treated surgically and antibacterial therapy was started with intravenous TMP-SMX (160/800 mg/qid; IV), and meropenem 1 gr/qid during a follow-up; clinical improvement was observed. Abbreviations: MIC, minimum inhibitory concentration; R, resistant; S, susceptible. Decomposing plant debris, water, and soil are the main reservoirs for a variety of actinomycetes, especially Nocardia species (4, 9), which are of interest for the complete biodegradation of soil and are considered to play an important role in organic matter turnover such as oil degradation under growth limiting conditions, particularly in dry and/or acidic soil (12). However, some species are considered as infective agents, mainly pulmonary nocardiosis in otherwise healthy individuals, since they are easily dispersed into air by their hydrophobic nature (13). Remarkably, the most common extra-pulmonary location of involvement is in the central nervous system (CNS), while cutaneous and soft tissue nocardiosis can result from traumatic inoculation to the skin involving contamination with soils (7, 14). Disseminated nocardiosis is detected in severely immunocompromised patients such as patients with acquired immune deficiency syndrome (AIDS), the ones who underwent solid organ and hematopoietic stem cell transplantation, patients with solid organ malignancies, and those using systemic steroid, predominantly (3). Previous study reported an overall mortality rate of 25% in 53 patients infected with Nocardia species (81% were immunocompromised) (15). The risk factors (administration of corticosteroids) as well as the clinical presentation were classic for nocardiosis in the patient (16). In the present case, subcutaneous infection was revealed on cultures. Although nocardiosis is generally considered as a hematogenously disseminated infection, isolation of Nocardia species by blood culture is uncommon (1, 5). Remarkably, up to 40% of nocardiosis cases usually begin in the respiratory tract and frequently disseminate to CNS, skin, and soft tissues (17). 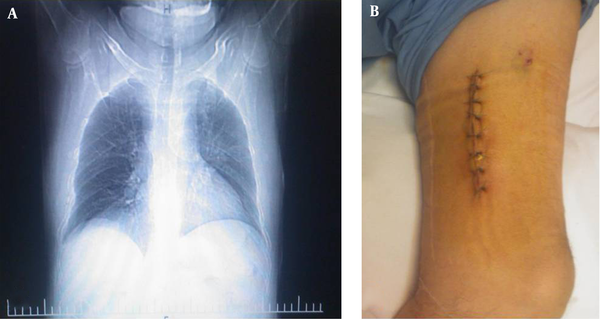 Disseminated nocardiosis presents with cutaneous lesions in approximately 2% of cases. Skin and soft tissue disease can usually result from traumatic implantation of the organism to the skin involving contamination with soil. Cutaneous lesions, which occur secondary to hematogenous dissemination, are typically multiple and widespread (5). In the present case, subcutaneous abscesses encapsulated on the left thigh were simultaneously observed on admission. Nocardia spp. abscesses may occur as an isolated lesion, but they are usually multiple (18). The route of infection was indeterminate since patient did not remember any history of travelling to rural areas, trauma or puncture at the sites of infections and the site of onset of nocardiosis was unclear. No wound was observed on the surface of the patient’s skin. In the current case, the lungs might have been the first infected organs by direct inhalation of Nocardia species from contaminated soil, whereas a nodule with cavitation lesion by CT scan might be due to the dissemination of the etiologic agent from this initial site. The CT scan of the chest, bronchoscopy and CT scan of the brain in left upper lobe were performed; consolidations with air bronchogram in the left hilum accompanied by adjacent thin walled cyst and a few patches of ground glass opacities in the lower lung, purulent secretion, and a few hypodense lesions in deep white matter, which the largest was in the right frontal, respectively. Delay in diagnosis and treatment might have contributed to death. It was suggested that the survival rate might be higher if the diagnosis was made earlier in the course of the disease (5). Laboratory notification of the clinical suspicion for Nocardia sp. infection is important to take proper steps to identify the bacteria (19). Phonotypical identification of Nocardia sp. is difficult since conventional approaches are relatively time-consuming and considerable expertise is required (7). Therefore, molecular methods with sufficient specificity and sensitivity should be employed. Morphological, physiological, and molecular characteristics can play a crucial role to identify Nocardia species (20). While no valuable standard therapy is available for nocardiosis, surgical excision is successfully applied in a number of cases. Most forms of the disease require both surgical and therapeutic treatments, except for pulmonary nocardiosis, where antifungal treatment is not usually of benefit (4, 5). TMP-SMX for 6 months or longer is at present the most used antibacterial agent for nocardiosis, especially in immunocompetent patients (5). In most situations, the choice of treatment protocol depends on the site of infection, size of lesion, the etiological agent, the host status and clinical manifestation (21). In the current case, the patient was initially treated with vancomycin and ceftazidim but no improvement was achieved. As a result, surgical intervention was performed (Figure 1B). Although several studies reported that a combination therapy with surgical excision has a synergistic effect and appears to be the best treatment for extended lesions, new potent antibacterial drugs may help to improve the management of these infections when sufficient data on their in vitro activity are available. The current study was granted by the school of medicine, Mazandaran University of Medical Sciences, Sari, Iran. Authors are grateful to Mojtaba Nabili for excellent technical assistance and help with sequencing and antifungal susceptibility testing.